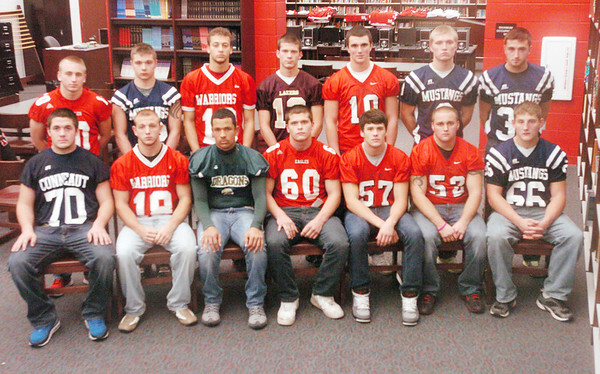 THE STAR Beacon First Team Defense includes (from left seated) Billy Post of Conneaut, Anthonie Magda of Edgewood, Shawn Gilbert of Lakeside, Matt Kozlowski of Geneva, Troy Stitt and Shayne Crumrine of Jefferson and Glenn Zaller of Grand Valley. (From left standing) Dakota Brininger of Geneva, Sean Szitas of Grand Valley, Riis Smith of Edgewood, Grant Nowakowski of Pymatuning Valley, Kyle Ashburn of Jefferson, Jake Vormelker and Stanley Sirrine of Grand Valley. Quintin Ratliff of Pymatuning Valley is not pictured.